I love the colors I got from simple Kodak 400 Gold film. They do seem just a bit off somehow, maybe a bit too much purple in the sky, but I love them nonetheless. 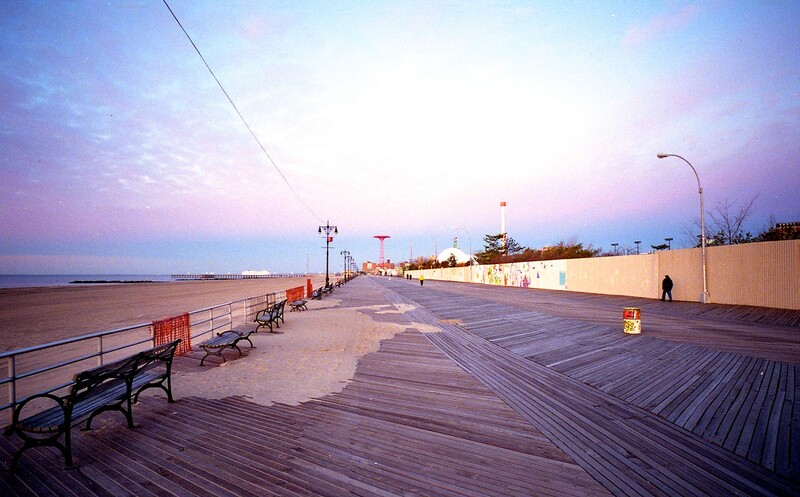 The Coney Island Boardwalk is mostly, but not completely deserted, on a winter morning in January 2012. It does seem like there is a fair amount of purple in this, but I am diggin how that interacts with the wooden walkway. I also like that trash can, or what I am assuming is the trash can, adding some contrast! I like the colors too and they seem to work well with this image! I like the converging lines ending at the tower thing back there (can’t remember its name). Very cool shot! beautiful image to be post..Nice shots with your Kodak 400 Gold film.Thanks for sharing your pictures.. The lines on the Boardwalk make this one Mark, Nice! I like the scenery. The boardwalk is awesome.